Donald Duck Shrimp or Plume Shrimp is a small weird looking sea creature. These shrimps are scientifically known as Leander plumosus. They live in the shallow coral reefs of Maldives Islands. Even before 1994, no one knew anything about this species of crustacean. A Donald Duck Shrimp has a long rostrum. It almost seems like a long beak. That duck like beak has given it the nickname “Donald Duck”. The pseudo beak is also hairy. Donald Duck Shrimps are rare. They are small in size. Their average body length is 2 to 1.5 cm. There orange body color and bizarre shape helps them to hide well in the coral environments. Very small sea worms and larva of other species are their main food items. They are carnivores. L. plumosus belongs to the Palaemoninae sub-family. Palaemoninae sub family members are all carnivores. They are all shallow water dweller shrimps. There are 29 species including our shrimp in this group. 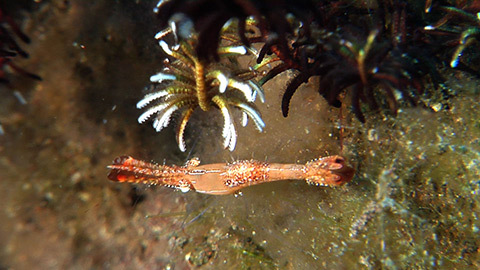 Plume Shrimp cannot be seen or found very often. That is why any extensive data about them is not readily available till date. That is why there conservation status is unknown. We have said earlier that L. plumosus have a beak like long “rorstrum”. A rostrum is a beak like body part. Many animals have them like Bottlenose Dolphins, Weevils, many types of bugs etc. 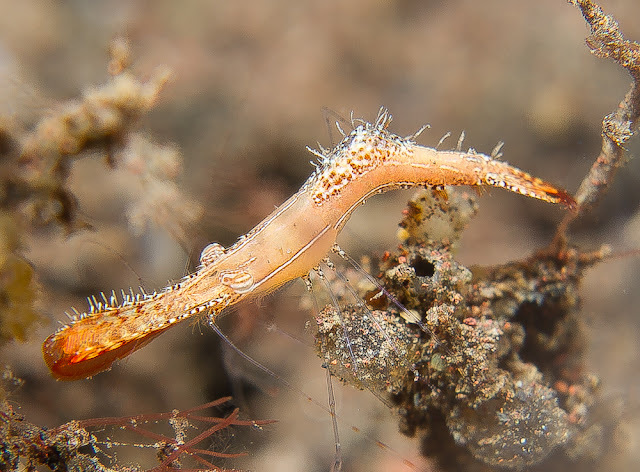 In case of shrimps, the rostrum is nothing but an extension of their carapace or head shield. What is the difference between a shrimp and a lobster? Shrimps and Lobsters are closely related aqua animals. Anybody can guess that from the similarity of their shape. Shrimps can be found in both fresh and salt water bodies but almost all of the lobster species are marine dwellers. Another importance difference is size. Lobsters are considerably bigger in size than the shrimps. Shrimps are swimmers but lobsters are bottom crawlers. The pregnant shrimps carry the eggs inside their body but lobsters are not known for such behaviors. Where do Donald Duck Shrimps live? They are small marine animals. But they do not live everywhere in the oceans. They are very localized creatures. Till date, these shrimps are only located in the shallow coral reef areas of the Maldives islands. Why the Plume Shrimp is called as a “Crustacean”? Crustacean is the name of a group of invertebrate animals. Their bodies are covered with protective shells or exo-skeletons. The exo-skeleton of a crustacean is made of many smaller plates. Most of them live in water – both in rivers and oceans. Some of the well known crustacean are crabs, shrimps, lobsters, prawns, crayfishes, etc.